The series of military K-9s are stand-alone books where each story tells of how a canine aids in tracking down a killer. Each novel is written by various authors all within 2018. So, if you enjoy these military type tales, here is a treasure trove! The titles are Mission to Protect, Bound by Duty, Top Secret Target, Standing Fast, Rescue Operation, Explosive Force, Battle Tested, Valiant Defender, and Military K-9 Unit Christmas. Many of the authors I am familiar with and the stories published thus far have been very good and enjoyable to read. Just FYI a couple of the last books listed haven’t been published yet, but are slated to one a month through December 2018. 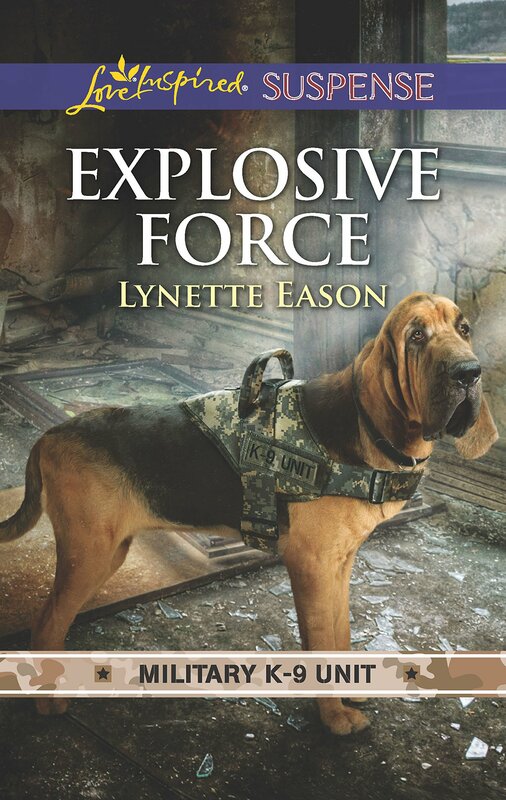 In Explosive Force, First Lt. Nick Donovan and his bomb sniffing canine are called out to the base after a bomb has exploded, injuring a couple people and the perpetrator escaping. Heidi Jenks is on the base doing a story when the bomb goes off and is slightly injured. When she and Nick meet, there are sparks but it isn’t attraction they feel toward one another! As the reader progresses through the book, slowly Lynette Eason reveals who is the target, why that person is being targeted and the need to capture the person responsible is proving difficult. Heidi is in the service, doing interest stories on various personnel but wants to prove her ethics as a reporter are above board just like her father. Nick had a negative experience that colors his reaction to any and all reporters. Can he trust Heidi, or will she show that she is just out for the scoop? These books are short quick reads and easy to carry around in a back pocket, purse or briefcase, making it easy to pull out when waiting for a meeting, appointment, etc. Thrill seekers, suspense lovers and romantics at heart will thoroughly enjoy the books from the first word till the very last. These are a great way to share stories with friends and family!